Hakusan, Japan, March 12, 2014 – EIZO Corporation (TSE: 6737) announced the release of the RadiForce LS580W, a 58-inch large monitor solution for operating rooms. In the operating room and interventional suite, essential information such as X-ray, endoscopic images, and heart rate is typically displayed using several different monitors. The RadiForce LS580W provides a 4K ultra HD solution for viewing a variety of vital information, displaying 8 megapixels of high-resolution data on a single screen. 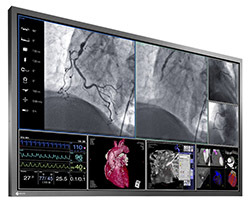 It is the latest addition to EIZO’s line of OR solutions, which also includes large monitor managers for gathering input data and a 60-inch medical monitor solution. Compared to its predecessor, the RadiForce LS560W, the screen size has been increased to provide an extended viewing area for keeping images organized and efficient. The bezel thickness was reduced, allowing for a larger screen while maintaining the same physical dimensions as the previous model. In addition, the reduced bezel size contributes to the monitor’s lighter weight. The consistent size allows convenient installation using the same ceiling suspension as the previous model. The RadiForce LS580W is equipped with two independent mercury-free LED backlights that are highly efficient compared to conventional CCFL backlights, saving energy even when running at high brightness levels. Redundant power supplies and backlights as well as two DVI inputs give the monitor a high degree of operational reliability for creating a fail-safe environment. A monitoring function can be configured to notify the X-ray system in the event operating conditions becomes critical or a component fails to ensure maximum safety. The contrast ratio of the RadiForce LS580W has been greatly improved from the RadiForce LS560W to 4000:1, providing exceptionally clear images and deeper blacks. To ensure the most accurate and consistent shadings possible, EIZO carefully measures and sets every grayscale tone on the production line to offer medical monitors that are fully compliant with DICOM Part 14 international standards. Production of the RadiForce LS580W begins March 2014. Availability varies by country so please contact the EIZO group company or distributor in your country for details.